The 19-year-old got moved to the fourth line Wednesday, but he was back on the second line at Friday's practice. 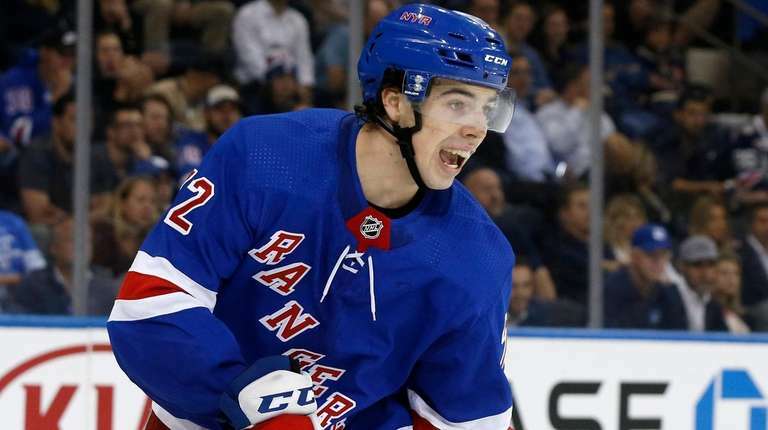 GREENBURGH, N.Y. — Filip Chytil was back on the left wing with second-line center Kevin Hayes and right wing Mats Zuccarello at practice Friday after coach David Quinn dropped him to the fourth line in the third period of Wednesday’s 4-3 overtime loss to Washington. Quinn stressed that he believes Chytil, 19, is good enough to help the team right now and that he just needs a goal to lift the weight off his shoulders and open the floodgates. Hayes and Zuccarello keep talking to Chytil, trying to keep his confidence up. “I’ve gone the first 10 games without a goal,’’ said Zuccarello, who has five assists and a shootout goal this season. “I do that almost every year. So I know how that feels.